Smiling, I begin my explanation. I grew up in the 1970s, when economic times were tough. Money was tight at home, but I never really knew it. And when the wallet is light, your grocery shopping habits have to be meticulous. So we’d buy store brand stuff. Or that “No Frills” brand that seems to have become obsolete. Enter Velveeta. Velveeta made the BEST grilled cheese sandwiches ever. Velveeta had that beautiful orange color. Velveeta was a rectangular brick of sunshine! Velveeta wasn’t presliced — you had to use the special grown up cheese cutter with the wire to cut it! Velveeta was class! Velveeta was also a couple of bucks per box. Which made it a luxury item. 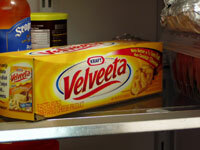 When we had Velveeta in the house…times were good. Velveeta was definitely NOT a weekly staple. Years pass, and I get married. The first 6 months of BvP’s and my marriage were tough. We were flat broke. And when I grocery shopped, I faced the same dilemma my Mom faced 20 years prior. Get the Velveeta…or spend that money on something more practical. Practicality almost always won. Tonight I’ll drive my 1-year old car to my lovely, just-purchased home. I’ll slide in my socks across the Pergo flooring of the kitchen. And I open my refrigerator door (which makes ICE!!) , I will see the large, 2-lb box of Velveeta, prominently placed on the shelf. And I will smile and say a silent prayer of thanks for my good fortune.